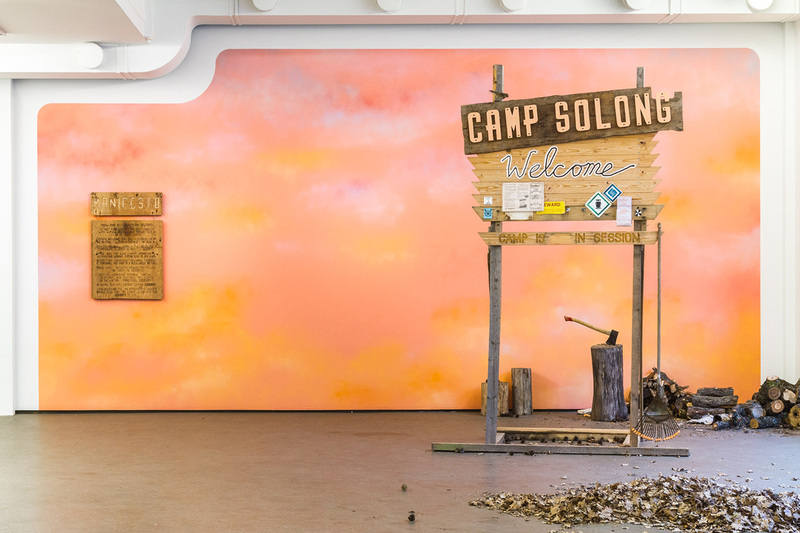 The Camp Solong: Nonstop Sunset exhibition accompanied the site-specific Camp Session 2017 in Ekenäs, FI, running throughout the summer at Sinne Gallery in Helsinki. 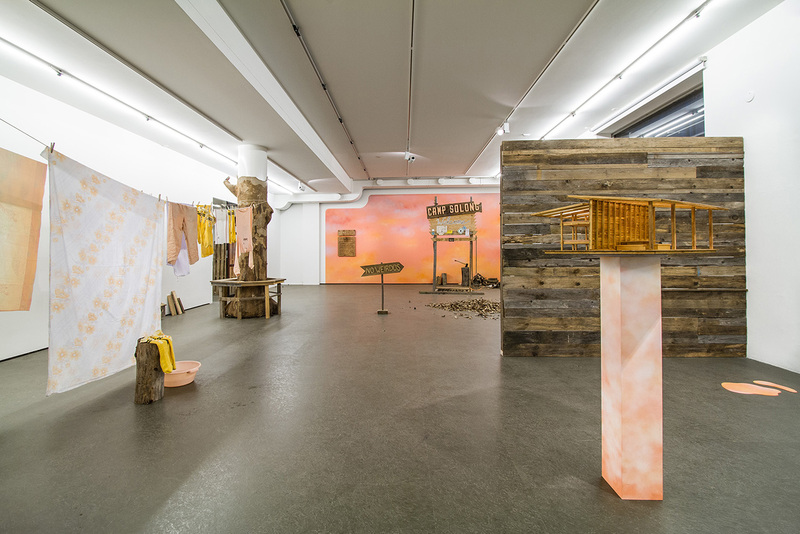 The exhibition, curated by Jonatan Habib-Enqvist, catered to visitors in the center of the city, whereas, (albeit also being openly viewable to the public) the summer camp was more remotely located. 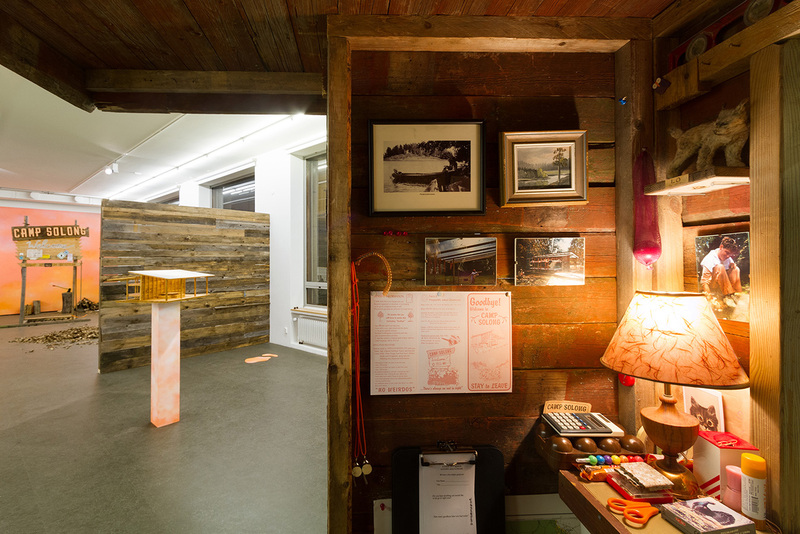 In the exhibition the audience could receive assistance with their camp applications, as well as experience a taste of life at the camp itself, through, for example, napping sessions in the installation’s bunkbeds, complete with “read-out- loud stories” provided by trained “camp rangers” working in the exhibition. Life is full of goodbyes. So say bye-bye to the solemnity, identity and reliability that the mechanisms of contemporary society demand. Say bye-bye to practicality as a yardstick for life and art. Whatever it is you want to bid farewell to, you are welcome to come to Sinne at Stora Robertsgatan 16, Helsinki, to be inspired by Camp Solong. You will share the experiences of previous participants, learn more about this year’s three-day summer camp in Ekenäs in July, and be able to apply to take part. This is a unique opportunity to experience bodily wellbeing and self-aware repose. There are just six places for campers. 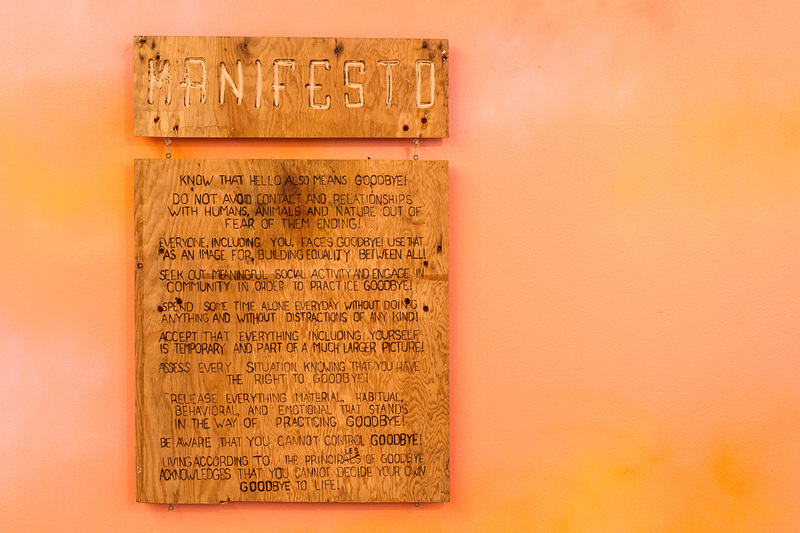 The micro-communities in the exhibition and the camp investigate, and hopefully awaken, new perspectives on affect-based economic systems and parallel paths to socialization. Rather than a scout camp that mimics military routines through a kind of masculine rite of initiation by way of an encounter with the forest, Camp Solong springs from a desire to create a place for flourishing. Play is used to investigate various aspects of the traumas of modern life and preconceived ideas about pain and happiness. Goodbyes cannot be avoided – “Every day, people face each other and say goodbye. If it’s not your face saying it today, it will be someone saying it to yours, another day,” declares our dynamic counsellor with conviction and sincerity. There is no room here for irony or cynicism. Since, even if it might sound incongruous, it is only when play is approached with a raw seriousness that it can truly transform our actions in ways that cast doubt on much of what we take for granted in our daily lives. Taking play seriously means letting yourself momentarily lose your foothold. This might be described as private research processes that let us be in the moment, to experiment within an agreed framework that can, at the same time, free us of other demands such as utility or goals. Camp Solong invites you to welcome your goodbyes with play and delight. Get a bunk with your own personal shelf, dig a hole, and learn to say goodbye to your new-found friends. You will get insights into how to rid yourself of emotional baggage, and perhaps find the key to the joy of separation in the grab bag of your soul. Together we learn to bid each other farewell. This will be a lifelong memory. Camp Solong is an ongoing nomadic summer camp, a temporary, small-scale society that challenges stereotypical constructs. 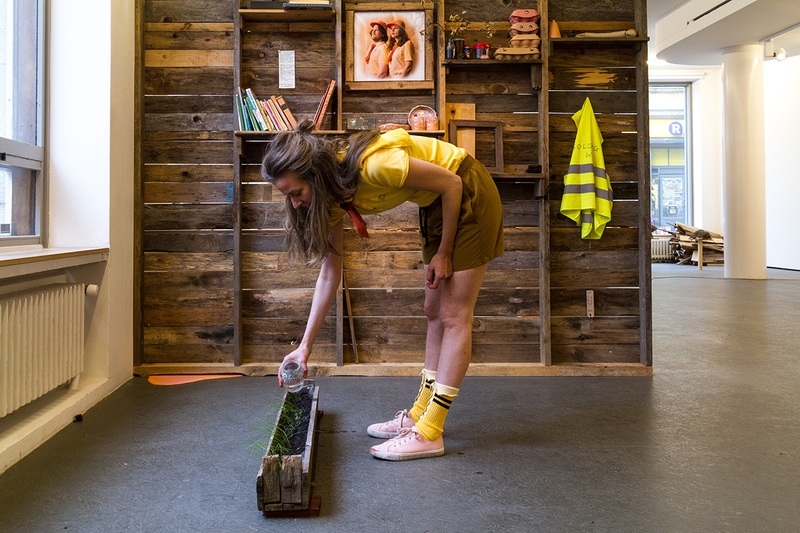 In so doing, the camp is a form of heterotopia – a provisional model for another way of living with the focus on play, time, introspection and emotional healing. In other words, Dafna Maimon and Ethan Hayes-Chute build huts and dig holes, while adhering to an immersive performance tradition that studies the obscure boundaries between identities, bodies and emotional landscapes. The boundary lines between viewers and participants, audience and practitioners are dissolved as successive layers of performativity emerge. 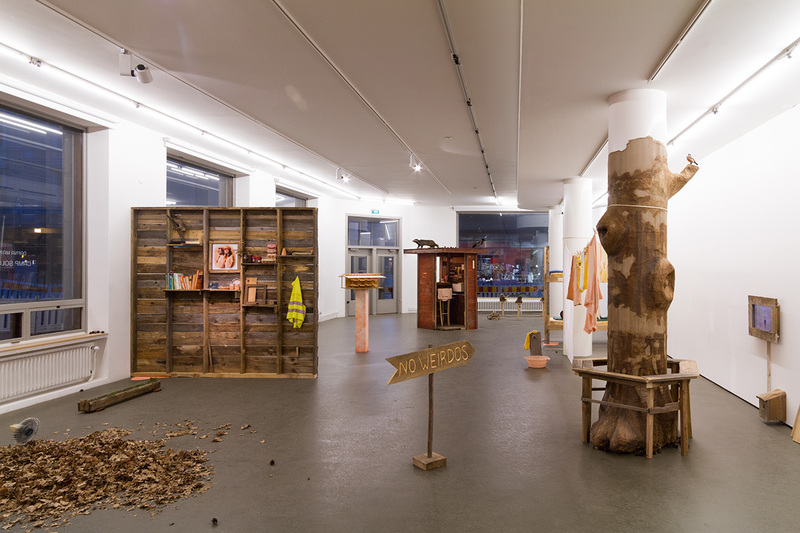 How are we to understand the relationships between the artists and the participants, the mutual relationships between the participants, the camp’s relationship to passers-by, and not least your role as audience?